Stock Picking Carts (SPC) are ideal for all order-picking and stock putaway tasks in warehousing, retail, and industrial applications. They include an integrated step ladder for access to higher shelves, with multiple safety features, including locking casters, floor brakes, and cutouts in the steps for greater grip. Three lipped shelves support heavy loads for high-capacity picking. 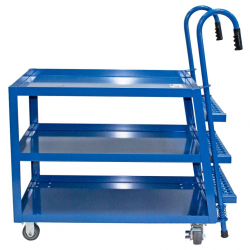 Carts roll easily on two fixed and two swiveling casters that improve maneuverability, while the long frame allows access to narrow aisles. These units are constructed of steel and powder-coated for durability, resistance to damage, and long service lives. Heavy-duty construction also makes the SPC suitable for use with heavy components in manufacturing and other industrial operations. Ergonomically curved push handles with comfortable grips reduce the risk of injury for users. Custom models are also available to meet any specifications. To learn more about Stock Picking Carts and other material handling equipment from BHS, call the sales team at +1 314 423 2075.